NHL realignment is the hot talk around the league right now, and I know reviews are mixed concerning your latest plan to re-shape the NHL. The first round of the playoffs features divisional play (1 vs 4, 2 vs 3). After the first round, the remaining teams are seeded 1-4, with 1 playing 4, 2 vs 3, etc. Now, the Penguins and Flyers hate this proposal, because they’ve got a good rivalry going that fills their rinks, and playing in different divisions will hurt that. Teams in the proposed eight-team divisions also have a gripe, because mathematically they have a smaller chance of making the playoffs than teams in a seven-team division. But you know what Gar (can I call you Gar, as in Danny Gare? ), I think you should tell these complainers to stuff it. Your proposed plan reduces travel, solves most (but not all) of the league’s geographic issues, and doesn’t do too much to upset most of the NHL’s current/historic rivalries. Listen. I’m in a charitable mood. I like what you’ve done for hockey in Edmonton and Winnipeg. I like the salary cap era. Here are two tweaks that take your plan to the next level. The biggest gripe I’ve seen outside of Pittsburgh and Philadelphia involves the notion of 8-team divisions and 7-team divisions competing for the same number of playoff spots (4). The first round of the playoffs still features divisional play (1 vs 4, 2 vs 3). After the first round, the remaining teams are seeded 1-4, with 1 playing 4, 2 vs 3, etc. With this small tweak, every team in each Conference has the same odds of making the playoffs. Columbus joins Detroit moving to the East, where both teams geographically should be and want to be. 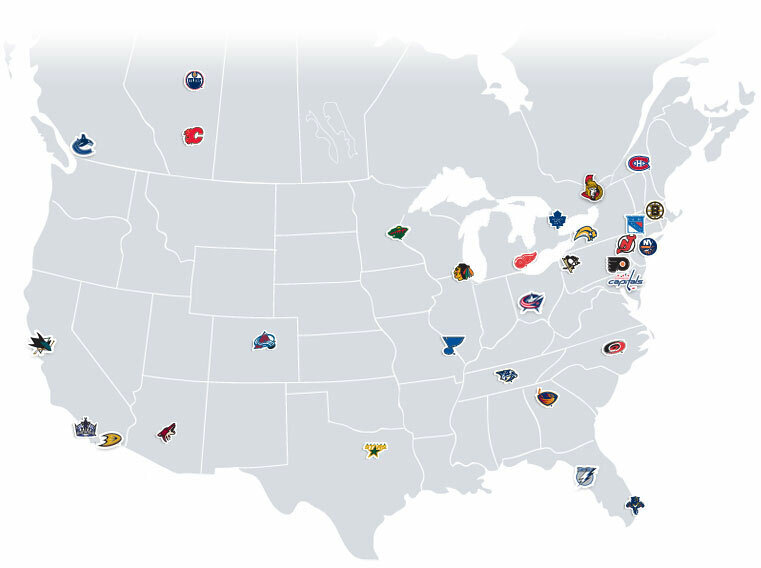 Colorado moves to the “Central-esque” division, where it probably could be if you ever looked at a map of all NHL teams. Sure, someone may suggest that there’s a greater chance of making the playoffs in the Western Conference than the Eastern Conference. You know what I say to them, Gar? That’s the price you pay for saving thousands of dollars on travel costs, you cheap bastards. Actually, there’s only one issue with this tweak. What the heck happens if you have to move the Coyotes out of Phoenix? Yes Gar, I know that will never happen. I know you’ve been spending the last few years trying to decide which of the 100s of potential owners you want to give the Coyotes to so that the team can stay in Phoenix. So, here’s how you solve the 8-team/7-team disparity, while revolutionizing your sport. The four Conference teams with the next best records get the final four playoff spots and the top four teams select their first round opponent. Division winner with the best record picks first. Then the other Division winner. Then the second-place team with the best record. Then the other second-place team gets whoever’s left. In the second round, teams are reseeded 1-4 based on regular season performance, with 1 vs 4, 2 vs 3. Think about the possibilities that result from having teams choose their playoff opponent. First of all, winning a division or conference would suddenly matter quite a bit. The NHL would reward the best regular season teams by giving them some control – whether it be reduced travel or a weaker opponent. The 11 remaining conference teams would also have equal odds of becoming one of the final four playoff teams – eliminating the eight-team, seven-team divisional bias. There would be added buzz in April and March as fans talk about potential matchups and seeding races. Instantly, rivalries would be created or renewed once selections are made. Pittsburgh and Philadelphia are mad because they don’t play each other as often? Well, problem solved – one can choose to play the other in the first round if they have a good regular season. Gar, you could take this idea and create another television event, one that would be unique to the North American team sporting market. It would be a professional sports version of the NCAA’s Selection Sunday event. It would be just like the MMA or WWE, where opponents choose one another all the time because it always delivers a compelling storyline. Mr. Commish, I offer this idea free of charge…although I wouldn’t mind having a division named after me. Or maybe I’ll just take a lifetime invite to the Winter Classic. It’s something we can negotiate later. Isn’t this about the time that the Oilers start falling back to earth? And yet, they played a terrific road game against the Kings, giving up only 19 shots. Same thing can be said about the Toronto Maple Leafs, who are amazingly in first place in the Eastern Conference right now. Then again, it’s been a long time since the Maple Leafs had two scoring lines going like they do right now (Joffrey Lupul-Tim Connolly-Phil Kessel; Clarke MacArthur-Mikael Grabovski-Nik Kulemin). Watching the Blue Jackets-Leafs game, it looked like Leaf shooters were targeting Steve Mason’s blocker-side with great success (4 goals on 11 shots). Speaking of Columbus, this is the earliest they’ve ever gotten to 10 losses. A coaching change is on the way, but Ken Hitchcock isn’t the solution. The Blue Jackets are not strong enough in goal or on defense to play the conservative style Hitchcock demands. At the same time, he hasn’t shown much success coaching younger players, and future of this team is in its prospects. At the same time, anyone who is suggesting Craig Button is a viable candidate for the Blue Jackets front office should give their head a shake. He was a league-worst level GM in Calgary. Lest we forget the trading of J-S Giguere and Marc Savard for bags of pucks, the release of Martin St. Louis and the signing of Roman Turek to a mega-contract. I wonder how folks are feeling about the Erik Johnson for Chris Stewart/Kevin Shattenkirk trade these days? Johnson looks a lot like Bryan McCabe – a big shooter, decent skater with poor defensive instincts. At least McCabe was physical – Johnson plays a Jay Boumeester-like soft defense. Things aren’t puppy dogs and ice cream in St. Louis though either where Chris Stewart has gotten off to a very slow start (2 goals and 3 points in 11 games). In fact, right now the best player might just be Kevin Shattenkirk, who has taken another step, evolving into an intelligent, two-way defenseman playing alongside Alex Pieterangelo. CBC is counting suspensions and concussions this year so you don’t have to. Colorado’s Paul Stastny has yet to score a point at home this year. Mike Smith has been very good for the Coyotes thus far. Makes you wonder what went wrong in Tampa? Speaking of Phoenix, another factor in their early season success is the play of defensemen David Schlemko and Oliver Ekman-Larsson. Ekman-Larsson is becoming a factor at both ends of the ice, and looks more and more like a player you build a team around. Schlemko is strong skater who doesn’t make mistakes with the puck. Kudos to the Predators for inking Pekka Rinne to a 7-year/$49-million contract. Rinne is an elite goaltender, and having him signed long-term means Nashville has an important cornerstone in place. This probably means that one of Shea Weber or Ryan Suter is gone, especially since the Predators have some young depth at defense. It also wouldn’t surprise if Rinne’s $7 million annual salary becomes the defacto ceiling for Predator player contracts. One last Predators note – while the media (particularly in Canada) portray Nashville as hockey backwater, it’s nice to see the team showing it’s willing to spend to build a contender. Predator fans have more trust in the franchise today than they did yesterday. Chicago may just be the best team in the league right now. They’re scoring goals despite a terrible powerplay (8.7%, second-last in the league). Yes, the Minnesota Wild are getting strong goaltending. No, they are not getting the production they’d like out of Marek Zidlicky. Zidlicky wasn’t very good last year either, and certainly doesn’t seem like a top-line defenseman anymore. That no-movement, modified no-trade clause in his last contract is starting to look like a big, heavy anchor around GM Chuck Fletcher’s neck.